Since time began the Grakhul, immortal servants of the gods who choose who lives and who dies when it comes time to make sacrifices to their deities, have been seeking to keep the world in balance and the gods appeased. When they take the family of Brogan McTyre to offer as sacrifice, everything changes. Brogan heads off on a quest to save his family from the Grakhul. The decision this time is costlier than they expected, leading to Brogan and his kin being hunted as criminals and the gods seeking to punish those who’ve defied them. 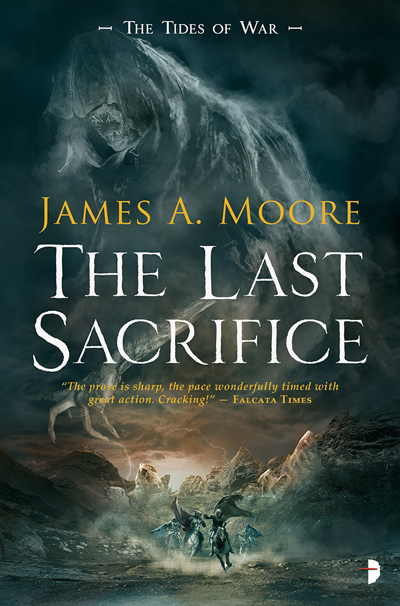 James A Moore is the author of over twenty novels, including the critically acclaimed Fireworks, Under The Overtree, Blood Red, Deeper, the Serenity Falls trilogy (featuring his recurring anti-hero, Jonathan Crowley) and his most recent novels Blind Shadows and Seven Forges. He has twice been nominated for the Bram Stoker Award and spent three years as an officer in the Horror Writers Association, first as Secretary and later as Vice President. The author cut his teeth in the industry writing for Marvel Comics and authoring over twenty role-playing supplements for White Wolf Games, including Berlin by Night, Land of 1,000,000 Dreams and The Get of Fenris tribe. He also penned the White Wolf novels Vampire: House of Secrets and Werewolf: Hellstorm. Moore’s first short story collection, Slices, sold out before ever seeing print. He currently lives in the suburbs of Atlanta, Georgia.